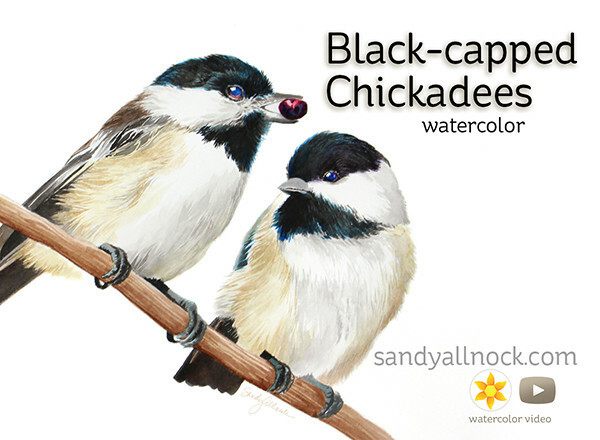 Today – by popular demand – my black-capped chickadee watercolor painting is 1) on YouTube, and 2) on Society6 – which means it’s available for prints and more! Read on below for details. Some of you were able to catch the live Periscope broadcast last week….for those who didn’t make it – you get to see the speed version today! I’m no longer going to leave the Thursday “Open Studios” on replay; the idea is to show people what it really takes to create a work of art, and the ability to speed it up and scrub through on YouTube and now on Periscope – that pretty well defeats the purpose! So if you’re around on Thursdays, feel free to pop in from time to time throughout the day (starting 8am Pacific time) and check in on progress. This time I filmed, but will not be filming them all for reposting on YouTube. (And this one was filmed on my “big” camera, this is not the low-end footage that is saved by Periscope.) Watch the video below, or click HERE to see it in HD on YouTube! The painting was created on Arches hot press watercolor paper, using PhMartin Hydrus watercolors, and Silver brushes. Are you ready for idea #2 for holiday gift-giving? Give the gift of art! I’ve purchased items from several artists at S6 – so bop around on the site and find something that’s perfect for the person on your list! After buying a few items from Society6, I decided to give it a go myself. (I have ordered some of my own pieces, and am awaiting their arrival; if you’d like to wait so I can tell you what the quality is like on *my* art, I’ll give you an update when that happens.) 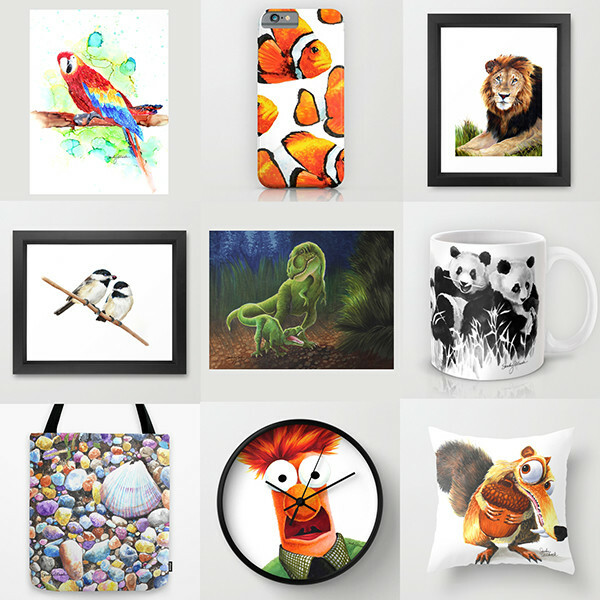 I’ve posted a number of my pieces on my Society6 page; some are available as prints only, others lend themselves to iphone cases, pillows, or mugs. Note that they put some on duvet covers and shower curtains which is….well, weird! I didn’t seem to have a choice, once I picked the items I did want, they just added the others. I receive a few dollars per item purchased at Society6, so it’s one way you can support the work I do! And I thank you for it! Here’s a little sampling of the kinds of things you can find there….click HERE to visit the store! I’ve just started in watercoloring and just love it — you’re work is absolutely beautiful and I can’t thank you enough for sharing the video. It is inspiring. Have a wonderful Healthy and Happy 2016. Ha – Bravo! I absolutely adore this video. The music is so delightful and to watch these awesome birds take flight. Did notice the eyes were done ahead of time. One of these days I’ll catch that part on Periscope. Wow, Sandy. They’re magnificent! I’m so glad you captioned the video and stated that it took 4 hours to complete… you always make it look so easy, but that had my head spinning! Just gorgeous. This is so beautiful. I love the blue layer on bottom that subtly shows through the black on top – making for a richer black color. I’m impressed by all of your work, but there’s something special about these adorable chickadees! I’m so glad the cards are available for purchase – got me some on order! Both of these are very cool and I don’t know… A giant Beaker on a shower curtain could be kinda fun! 😉 Big Hugs! Amazing! Thank you so much for the video! You are great. Wow, Sandy!! It was wonderful to view, and I LOVE these darling chickadees! You’ve really shown your truly artistry, my friend! I slowed down the video to .25 and enjoyed it even more to watch your strokes and process. Will definitely watch it many times over to learn more about watercoloring with the fine touches you have in this piece. It’s gorgeous, and I love that you are offering it for sale! Hugs! Thanks for the Society6 tip, found the perfect gift for my Dad for Christmas, he loves Beaker and yours is fabulous. Thanks for sharing your talent and positive energy with us. Smiles! Sorry! youtube goofup. It’s live now. Agree with all the above…tried to view video, and it says both here and YouTube that it’s private. Guess you will figure it out for us, but it’s gorgeous! Looking forward to seeing your video! Hugs! Love the Society6 idea. Just ordered the chickadee note cards for my sister for Christmas. Just beautiful. Myself also, private video! Would love to watch it!! I’ve been dying to see this beauty ever since the sneak on Patreon. Can’t wait till the link is fixed. I got a Private Video message as well. Wish I could see the process. I also got the private video message. But the picture is lovely.